CINCINNATI -- Kimberly Sims is making ends meet as a janitor on construction sites. But the Reading resident jumped at the chance for a better job when RWB Properties and Construction announced it would offer a free carpentry course. She’s a week from graduating from the 12-week course, armed with new skills and on a path toward becoming a carpenter making $50 an hour. Kimberly Sims breaking down a metal frame. “It was a little intimidating being around a bunch of men, not knowing how to chalk or find a stud or read a measuring tape. But ask me how to do all of that now, and I’ll be able to tell you,” Sims said. She’s one of about 20 students in the inaugural carpentry class that RWB is running out of a vacant factory in Avondale. The class is a promise kept to ensure that major development projects in Cincinnati’s Avondale and other Uptown neighborhoods will directly benefit residents in predominantly black, low-income areas. RWB is running the course, with a lot of help from other tradespeople, developers, a math teacher and a grant from Cincinnati Children’s Medical Center. HGC Construction sent 10 carpenters for a week of classes to show students the basics of woodworking. The first week was dedicated to OSHA safety practices, followed by math to learn how to make precise measurements. “These folks were here for a month and a half before they touched metal or piece of wood,” RWB Vice President Larry Bryant said. Including low-income residents in neighborhood revitalization is something that everybody talks about, but getting it done takes a lot of money and a lot of extra work. Students are learning how to build metal and wood framed walls as well as lots of carpentry basics and a lot of math, which turned out to be the biggest challenge for Roberto Madaris. “At first you have to know the numbers. That was the hardest thing for everybody,” Madaris said. 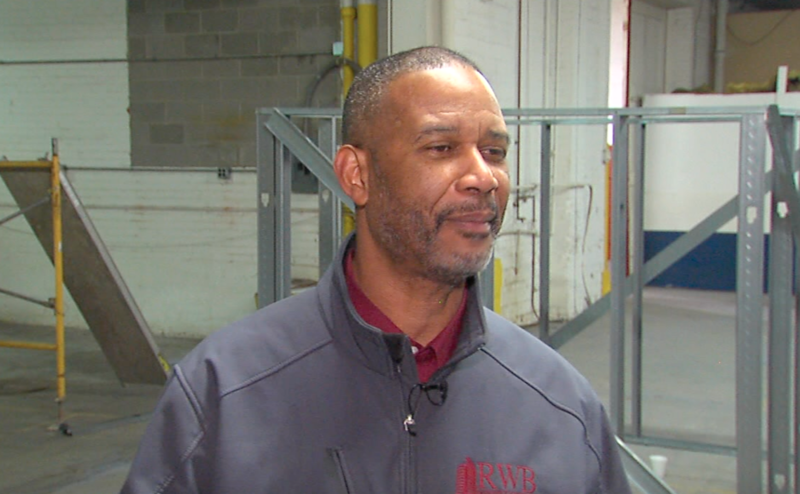 Madaris, who recently moved to Colerain Township, has been a laborer at RWB for six years. He expects his income to jump $10,000 to $15,000 a year when he get an entry-level carpentry job. Roberto Madaris breaking down a metal frame. “This carpentry class is to help better myself,” he said. Avondale Community Council President Patricia Milton points to the class as a bright spot in the slog to lift up residents as investment is pumped into the neighborhood. Is the program scalable to add courses for electricians, plumbers and other crafts? Bryant said it’s not so easy, pointing to a pile of metal beams that cost $2,000 per bundle. “Our two supervisors, Randy and Mark, they’re working 7 am to 3:30, and I’m dragging them here 4:30-7 p.m. to teach for 12 weeks, so that’s a lot,” he said. He can’t speak for other trades, but Bryant said they’ll do another carpentry course next year with the same partners, encouraged by the success of this first effort. “We’ve identified eight to 10 people who really have a skill set for this, and they’ll be hired by RWB,” Bryant said. Another five to 10 will be hired by HGC, Messer or other construction partners for apprentice work. “Seventy-five percent will be offered a job. That’s a pretty good placement rate,” he said.